Health club brand David Lloyd Leisure Group is opening the world's first café where diners pay for their lunch by exercising. 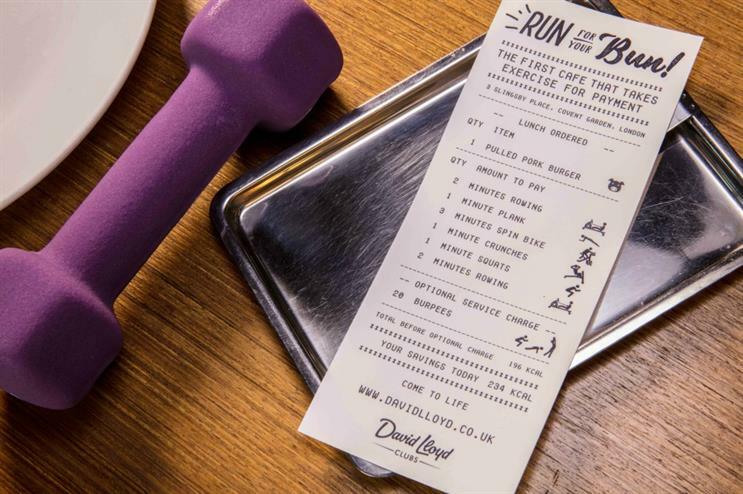 The ‘Run For Your Bun’ café, created by David Lloyd Clubs, part of David Lloyd Leisure Group, aims to highlight in a novel way the important role that food and exercise play in a healthy, balanced lifestyle. Fusing elements of a hip Scandi-style coffee shop with those of a gym, the café will swap cash tills and contactless payment terminals for treadmills, spin bikes, rowing machines and exercise mats. The activation will be implemented by Cow PR. Diners order their lunch item from the menu and then warm up for a 10-minute high intensity interval (‘HIIT’) workout as their method of payment. They then make their exercise payment to one of the café’s personal trainers before cooling down, taking a seat and refuelling with their delicious chosen lunch. As an example, a slow-cooked pulled pork brioche bun can be paid by doing two minutes of sprints on the treadmill, two minutes of thigh-burning hill climbs on the spin bike, a rapid row and a four-minute blitz of box jump burpees. The workout has been expertly created by personal trainers at David Lloyd Clubs and will burn around 150 calories, increase the heart rate to a fat-burning zone and tone the muscles. The high intensity nature of the workout will also trigger the so-called ‘afterburn effect’, in which the body continues to burn calories long after the workout has ended. The café will be hosted at Slingsby Place in Covent Garden, London and will open for three days over lunchtime, from 11-13 January. In October, Lucozade Sport launched the first ever get-fit bus shelter in Manchester in an effort to get the nation moving. Coconut yoghurt brand Coconut Collaborative hosted three workout sessions in partnership with Pop-Up Fitness in November.